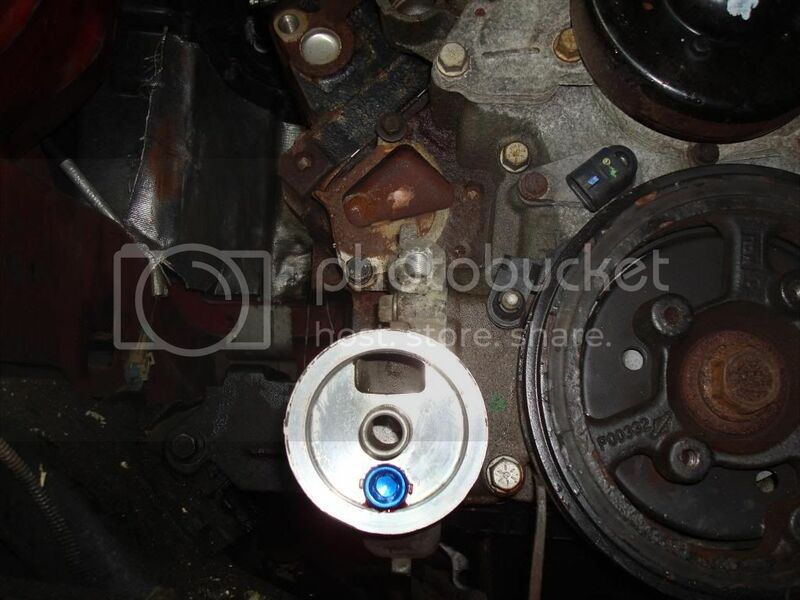 The blue one in the picture of the oil filter housing. Replaces the bypass valve. OP- I'm bout an hour south of you running the same general build! Whats your plan for tuning? replacing the bypass valve with a plug prevents oil from "bypassing" the oil filter and allowing unfiltered oil into the engine. Which is a common reason for failure in these engines. Its just another preventive measure when modifying these engines. DHP, and my location isn't correct anymore, just being lazy. NIC cam, ARP Head Studs, LS6 springs, LS7 lifters, Flowmaster catback, Ram-air mod. What dhp? And you said mile high, so I assumed Denver. I just got the npt fitting in your picture. I was wondering what all do I need to do to install it? you have to take the oil filter housing off the block and clean it. Then figure out how to get the bypass out. Some guys pry it out, others drill. For me, I took a one size bigger drill bit and touched the opening to take off the ridge that holds the plug in. Then i just let the bypass fall out, tapped the hole and threaded the plug. Was super easy that way and clean. So is the bypass in the block or is it on the filter housing? Any pics of the process? the pic with the blue plug in it is where the bypass is. You unbolt it from the block then modify it. I just pry it out. the "valve" is soft, the housing is soft, and the staking done by the facory is not that strong. Usd2sing sent me this photo to help show you what the bypass looks like. Hopefully that helps you and its the best I think we can do lol for pics.